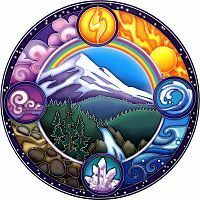 - Rainbow Mountain offers a meditation on the four elements: Fire, Water, Air and Earth. These elements blend to create the wonders of the natural world. 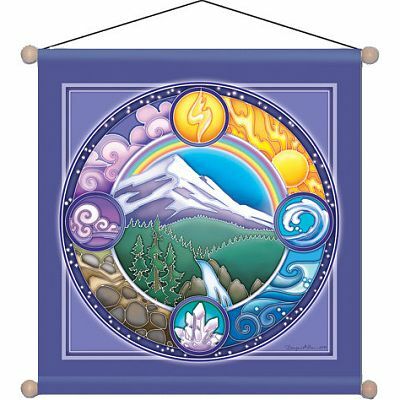 Our meditation banners are beautiful and silky-soft, printed in full vivid color on sheer, flowing knit polyester. They look like silk, but are durable and long-lasting, and they are great for indoor or outdoor use. They have a decorative wooden pole at the top and bottom, and a string for easy hanging. Banner measures 15" by 15". Do you have any other questions about our Rainbow Mountain Meditation Banner?